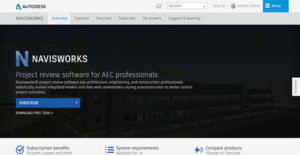 Navisworks is a project review and management software for AEC professionals and teams. It offers a holistic review of integrated models and data that involves stakeholders during the preconstruction phase for better control of project conclusions. This Autodesk product has two editions: Navisworks Manage and Navisworks Simulate. The former provides clash detection, advanced coordination, 5D analysis, and simulation tools. Meanwhile, the latter is more focused on the reviewing and communication of project details via 5D analysis and simulation. Each package has features that meet your unique review and management needs that let you complete your projects quickly and improve your bottom line. Detecting clashes in building systems is a laborious task that used to rely heavily on manual processes such as overlaying drawings on light tables. This can result in a dramatic increase in the volume of RFIs. However, you can mitigate that by using the enhanced BIM technology offered by Navisworks and cut down RFI volume for you to swiftly complete projects. Delays in project completion due to clashes are costly and can drastically affect your company’s bottom line. However, you can avoid that and streamline your workflows in the process with the help of Navisworks. The platform’s Manage edition allows you to swiftly detect mismatches and quickly resolve them. As such, you can stay within the project budget, avoid having to overspend, and save time. As nations rush to adapt to the ever-changing climate, AEC firms must also be smart in their designs to ensure that they do not extremely alter the environment. With Navisworks Simulate, they can make certain that their designs work with rather than against the natural backdrop. Navisworks has a simple but robust integration with BIM 360 Glue. This allows you and your collaborators to share models in the cloud and access them seamlessly. With this, you can facilitate the smoother flow of work processes by preventing bottlenecks due to team members’ inability to access important project files. Instead of working with separate data for design and construction, you can save time by putting them together in a single model. Navisworks aids you in doing this through its model publishing and model aggregation tools. If you are considering Navisworks it might also be sensible to analyze other subcategories of Best Building Information Modeling Software - BIM gathered in our base of SaaS software reviews. Each company has its own characteristics, and can require a particular type of Building Information Modeling Software - BIM solution that will be designed for their business size, type of customers and employees and even individual industry they cater to. You should not count on locating an ideal software that will work for every business no matter what their background is. It may be a good idea to read a few Navisworks reviews first and even then you should pay attention to what the service is supposed to do for your company and your employees. Do you require a simple and intuitive service with just basic features? Will you really make use of the complex functionalities required by experts and large enterprises? Are there any specific tools that are especially beneficial for the industry you work in? If you ask yourself these questions it is going to be much easier to locate a solid app that will match your budget. How Much Does Navisworks Cost? Autodesk Navisworks has two enterprise pricing packages, each with three payment options based on the length of time you wish to access the tools and features of the software. The pricing plans are listed below, as well as their inclusions, to help you decide which one is the best for your organization. You can also acquire Navisworks as a part of a collection together with AutoCAD, Revit, and more. Please note that fees indicated above are for a single user only. For accurate prices for two or more users, visit the website or call a sales representative. We realize that when you make a decision to buy Building Information Modeling Software - BIM it’s important not only to see how experts evaluate it in their reviews, but also to find out if the real people and companies that buy it are actually satisfied with the product. That’s why we’ve created our behavior-based Customer Satisfaction Algorithm™ that gathers customer reviews, comments and Navisworks reviews across a wide range of social media sites. The data is then presented in an easy to digest form showing how many people had positive and negative experience with Navisworks. With that information at hand you should be equipped to make an informed buying decision that you won’t regret. What are Navisworks pricing details? What integrations are available for Navisworks? Navisworks can integrate with BIM 360 Glue for data and workflow management. If you need more information about Navisworks or you simply have a question let us know what you need and we’ll forward your request directly to the vendor.